Walt, our oldest son, celebrated birthday Number 41 today. What a special gift! Happy Birthday, Walt. Husband Walter has been under the weather since Friday. We made a late night visit to the ER. Saturday and Sunday he had no interest in food, not even a nibble, but I am thankful that he seems to be feeling better today. He ate a bit of chicken noodle soup and a few crackers. That was my go to medicine in a Campbell’s can when I was a child. I hope he derived as much comfort from that soup as I used to. He felt well enough to take me to therapy this morning and follow that short trip with longer last-minute forays to finish Christmas shopping. We both followed up on that excursion with collapse and naps. We will be spending time with family members who are traveling to visit during this season. I am looking forward to the visits of our sons and their families and my brother and his family from Virginia. I am not looking forward to being without my laptop. It seems the graphics card is in a not-so-slow-decline. I have backed up everything except my draft of this post. My beloved MacBook Pro will travel back to Baton Rouge with youngest son Jeremy. He will deliver it to the Apple Store for shipping to the Apple docs. He is no stranger to the personnel there, and I am confident the laptop is in good hands. But blogging will be seldom to not at all until the patient is returned to my care in what I hope is a healthy condition. I have been approved for 15 more sessions with my occupational therapist at the neuro rehab center. I went through the evaluation routine Thursday Dec. 13 and had my first session Monday, Dec. 17. It felt great to be back working with my creative therapist. Joared, a blogger friend who has professional experience in the therapy field, articulated precisely what I felt during my Monday session. Joared is a speech therapist and her comments on my posts often contain nuggets of practical advice. Although I often want to join in the commenting conversation following some of her posts, I have had no success signing in to comment on her blog Along the Way. Hers is not the only blog where I am unable to comment. I have yet to find what the difference is between Blogger blogs where I can comment and those where I cannot. 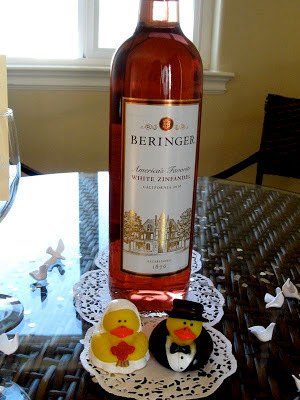 Dec. 3, I acted on a fellow blogger’s suggestion to change my settings on who could comment. As of Dec. 3 none of those auto-generated messages has shown up in the spam folder, but I wonder if any real people are having problems commenting. If you are, please email me. Our kids and grands will be arriving the day after Christmas, and the parents are helping with what promises to be a simplified Christmas meal this year. It makes me happy that they are creating the tradition of celebrating Christmas morning at home with their offspring. Their day-after schedule will also give me a bit more opportunity to finish wrapping, bagging and tagging gifts. 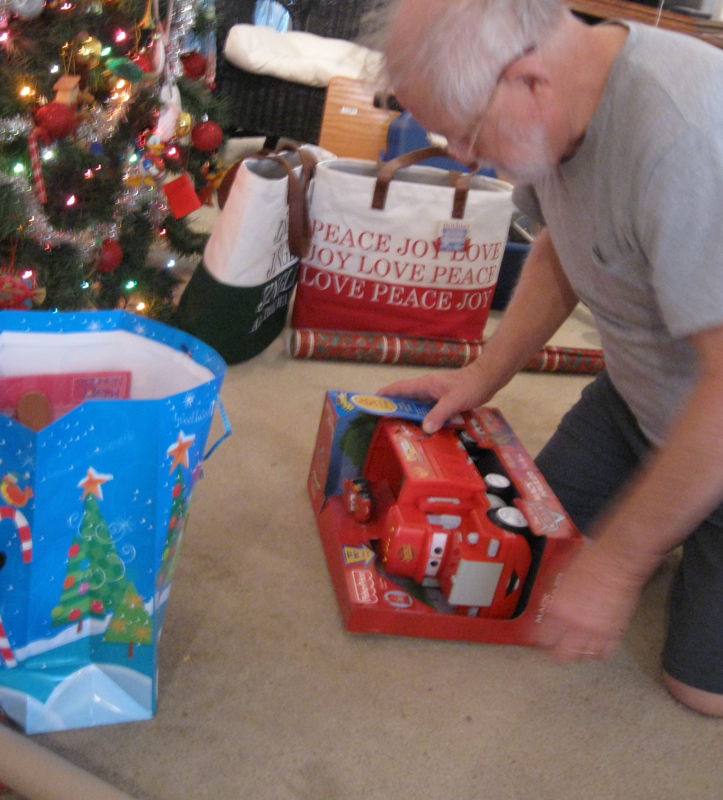 I know kids of all ages like ripping into wrapped presents. But wherever bagging works, that is how I will be finishing up. One-handed wrapping is frustrating. If I were not so last minute, I probably could have used some of the new products to make the process more doable. At least one ability has not been affected by my stroke. As I bag or wrap the remaining gifts for my family, I can still pray for each one and enjoy thinking about the love and joy each one brings into my life. And that is a gift too big to be wrapped or bagged. May your Christmas be filled with love and joy. In the prescribed position of hands clasped and eyes on the music teacher, Molly Kate, second from right, stands ready to sing. Husband Walter and I spent most of Wednesday on the road to and from Baton Rouge to attend granddaughter Molly Kate’s preschool Christmas program at St. Andrews Methodist Church. 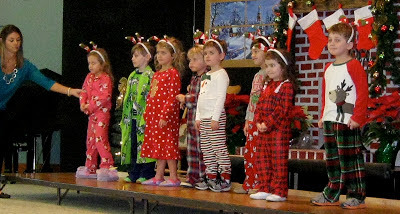 All of the little participants wore their Christmas pajamas for the presentation “Twas the Night Before Christmas.” Each class also wore a different style holiday head gear. Molly Kate takes school extra seriously. Even when her class was awaiting their second march to the stage, she kept her hands clasped and lips firmly sealed. Molly Kate is all business. She did smile a bit as her class was ready to return to the classroom and the anticipated Christmas party. But she almost immediately clasped those hands together again. Waiting for the doors to open and for the program to begin, we also enjoyed our two-year-old grandson Walker. Both maternal and paternal grandparents are interested to see how this little one will adapt to life in a preschool classroom next year. Walker visits with Baboo and Nana. Our daughter-in-law Katie’s family calls Walker "Jeremy Junior," because his personality as well as his appearance are much like his dad’s. As a child, Jeremy considered rules mere suggestions. He was creative about stretching rules as far as possible without technically breaking them. Jeremy and Katie have some fun days ahead of them. Yesterday was cold. I stayed inside and recuperated from Wednesday’s trip. I had already made my Christmas list, but I did check it twice to determine what gifts we still needed and what bastions of commerce we should breach to acquire them. I just assumed that no one was naughty, that all were nice this year. Husband Walter was definitely on the “nice” side of the ledger, stepping up, or in this case, kneeling down to wrap and bag the gifts already in our possession. Here it is Dec. 21, and we have a few more purchases to make. We have had several deliveries today from my online shopping. I hope the rest arrive in time. I guess it’s a tradition, always last minute. Husband Walter surprised me with a pleasurable fix for my addiction to Christmas lights this weekend. Friday he advised me to pack for an overnight stay. Saturday morning we set out early with the destination still a mystery to me. We wound up in Canton, Mississippi, a small town about 20 miles north of Jackson, Mississippi, our state’s capital city. The historic town square was charming. 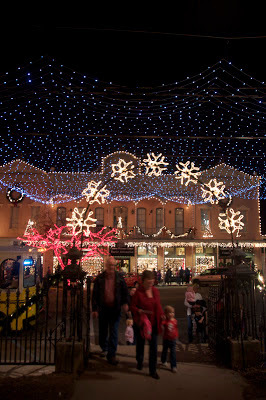 The old courthouse held pride of place in the center, and merchants had their store fronts dressed for the season. We have seen so many towns in our state that have fallen on hard times. Their old town squares are dominated by decaying, empty, boarded up buildings. Some have attempted revitalization through demolishing original structures and replacing them with buildings that are graceless boxes. Although there were some For Sale signs up, Canton has avoided both those extremes. We enjoyed a stroll around the square with peeks into shops and a few eateries. We also stopped into the Welcome Center, where I was delighted to see a Christmas tree with Victorian-looking ornaments and an antique sleigh that took up half of the premises. We were back for an evening in the square after lunch, check-in at our motel, and a needed rest. 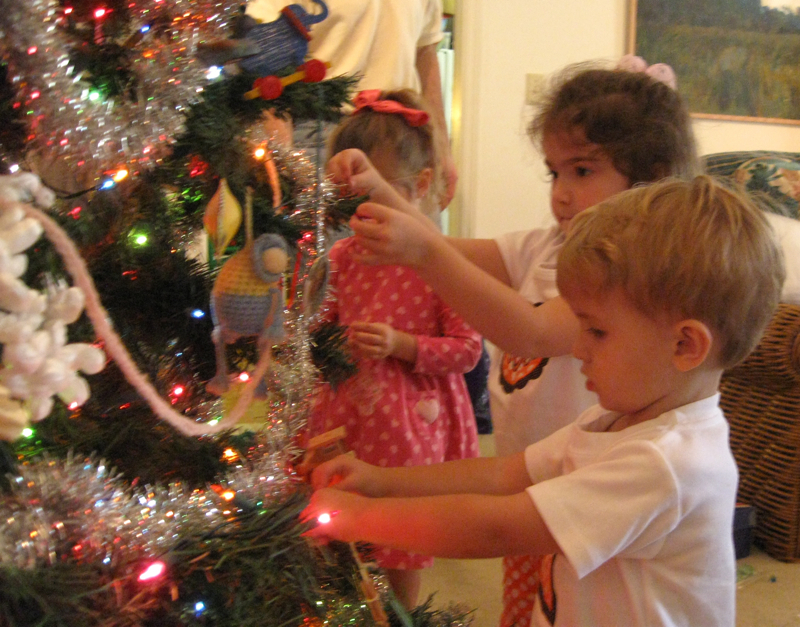 We had learned that a dedicated group of volunteers start “dressing” the square and setting up animated indoor tableaus in September to prepare for the Nov. 23-Dec.23 Christmas festival. Saturday night the square was filled with families with small children, couples and young people. All were vocal and obvious in their enjoyment and appreciation of the wonderland environment the volunteers had created. People of all ages were taking rides around the square. They kept the little “train,” a trolley, and two antique buggies pulled by real horse-power busy. In the midst of tragic events that have dominated our thoughts and prayers in the past few days, I find hope in people of good will who have worked so hard to bring moments of innocent enjoyment to others and a sense of unity to their community. Husband Walter’s photo of a family entering the square’s homespun wonderland. A happy reunion with Grandma Sugar, center, O'Neil and Sue, right, and their sons Matt and John, left. The purpose of our jaunt was to take my mother-in-law Grandma Sugar to visit Sue, her youngest sister, at her home in Kentucky. Hubby and his Aunt Sue were born only a few months apart. Next-door neighbors, theirs was a brother-sister relationship. Sue is energetic, caring and has a wonderful, infectious sense of humor. We requested that Sue and her husband make no plans for entertaining us. We just wanted to “visit” during our three-night stay. And visit we did. We caught up with this special couple, their grown sons, their sons wives and children, plus a couple of friends and neighbors who had traveled with Sue on earlier visits to Grandma Sugar. We headed home several pounds heavier but with light- and laughter-filled spirits. Our trip’s first stop on the way to our Kentucky visit was for the Christmas Fantasy in Lights at Callaway Garden and Resort in Pine Mountain, Georgia. The annual holiday lighting extravaganza is just one of the attractions of the 14,000-acre gardens and resort that is nestled in the Appalachian foothills. Our tour of the garden’s annual Christmas lighting display was the third for Hubby and me and the first for Grandma Sugar. She rated it nice but not in the same league with Bellingrath Gardens near Mobile, Alabama. I think one difference is that visitors walk through the Bellingrath display. 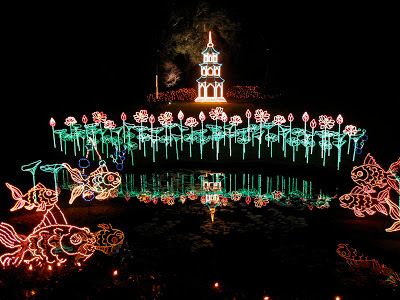 I assume most visitors view Callaway Garden’s light displays from private vehicle or from the Garden’s trolleys. The exception is a March of Dimes walking tour. 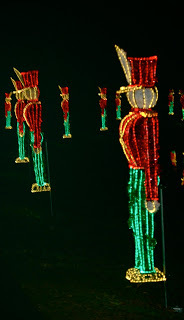 That colorful hike in 2008 was my first experience with Fantasy in Lights. 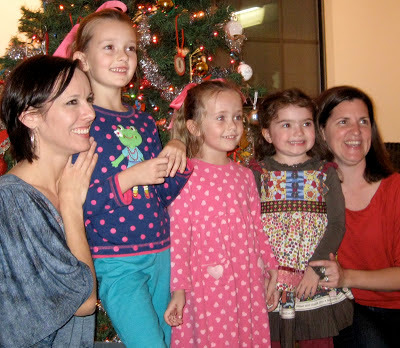 The one-night-only fundraiser evidently was an annual holiday tradition among many Georgia families. 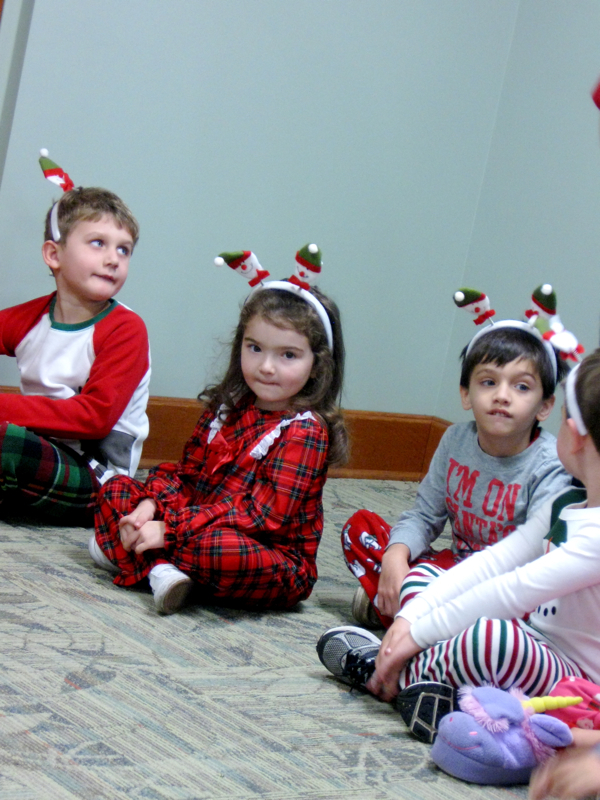 The festive crowd included adults, babies in strollers, kids in wagons, family members in wheelchairs. The light displays had not changed much this year, but for me there was a bit more magic at work when we walked the route surrounded by the whimsical plants, animals, toys, fairies and elves, all created in colored lights. Whether Callaway, Bellingrath or someone’s front lawn, I do enjoy Christmas lights. Charlie flashes a new smile. Our second day on the road was spent with our oldest son and his family. 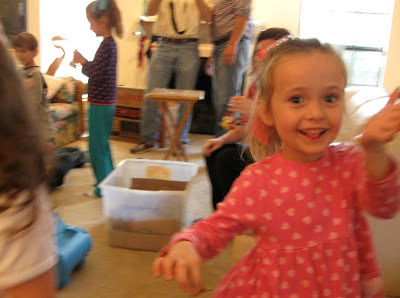 We arrived at the Georgia Skupiens’ home Wednesday in time to join the audience as granddaughter Charlie, six, arrived home from school. 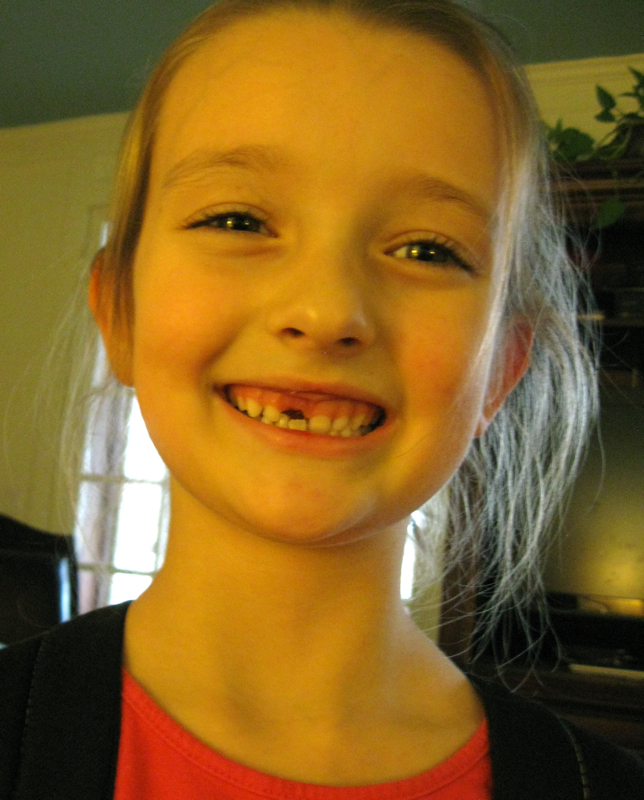 She regaled us with the saga of her first loss of a baby tooth. Charlie tucked the tooth in a special little box, and was happy and excited about an anticipated visit from the tooth fairy. The next morning, however, Charlie’s woebegone face clued us in that something was amiss. 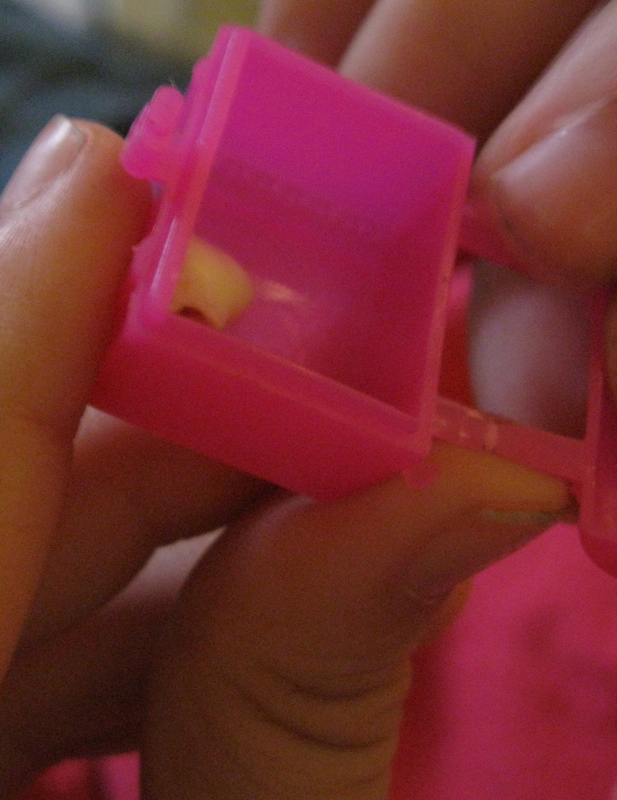 The tooth was missing from the little box that Charlie had stashed under her pillow, but the tooth fairy had left nothing behind. Daughter-in-law Sarah consoled a distraught and gap-toothed daughter. Sarah finally hit on a solution that Charlie embraced. 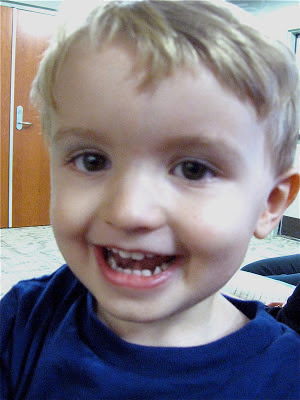 Charlie would write a letter to the Tooth Fairy alerting that dental emissary of the malfunction in the pickup and delivery process. Charlie loves writing and sending letters which she illustrates with abundant drawings. Her tooth was lost. But it will not be forgotten. And I am eagerly waiting to hear the rest of the story. We spent two nights in Gatlinburg, Tennessee. Our itinerary included attending that mountain city’s annual Christmas parade. There was the traditional Santa Claus, marching bands, floats and assorted princesses and beauty queens. But other parade units surprised me. I had never seen so many fire trucks together in a single parade, all with sirens full blast. And those Tennessee folks do love their cars. There was a Ford Mustang group, a group of ancient antique cars, vehicles from the 1980s TV series Dukes of Hazzard and even a string of those diminutive Smart cars sporting either elf ears or reindeer antlers and a Rudolph red nose. 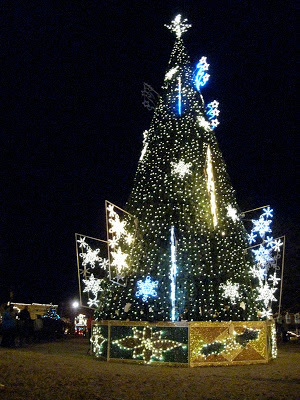 The most unusual unit, though, was an auto extravagantly decorated with Christmas lights. Husband Walter posted here about the parade, including his video of that vehicle bedecked with lights. Our youngest son and youngest grandchild presented husband Walter and me with the happy gift of an overnight visit this week. Two-year-old grandson Walker and his dad Jeremy made a quick trip from Louisiana the same day that Walker’s sister, mom and maternal grandmother left for a girls’ only jaunt to New York City. Walker was happy to have the undivided attention of Baboo and Nana. 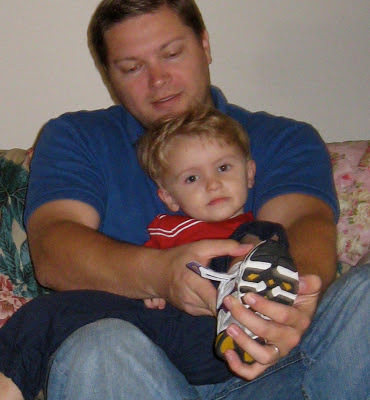 We were more than happy to provide that attention, and there were also cherished moments with son Jeremy. During the night, Walker woke up with upset stomach and was still not quite as active as usual early the next morning. When this child is still enough for me to easily snap a picture, it is obvious he is not feeling 100 percent. Eventually he perked up, and his trademark grin made appearances. During his dad’s mid-morning preparations for the return to Baton Rouge, Louisiana, Walker asked for “Mama” but accepted Jeremy’s reminder that Mama and Molly Kate were on the airplane to New York. When it came time for dressing and getting his shoes on, Walker grew quiet again and offered the opinion that he wanted to stay at “Baboo and Nana’s house.” Of course, that did our hearts good. Red and blue are the colors of the University of Mississippi, the alma mater of Walker’s parents. Their Louisiana friends and relatives are die-hard Louisiana State University fans and keep Walker and Molly Kate supplied with purple and gold attire. Jeremy, daughter-in-law Katie and kids enjoy tailgating at LSU games with Katie’s extended family, but Katie makes sure the kids and she and Jeremy don red and blue whenever LSU plays the Ole Miss Rebels. A mid-week call from Ocean Springs Neuro Rehab cancelled my appointment for the day and alerted me that my sessions through Medicare had run out. I hope I will be back in therapy in the new year. In the meantime I am finding it difficult to keep up with all my at home exercises when we are traveling and having overnight visitors. But both travels and visitors provide pleasure and huge doses of good medicine. I am hoping that lifting little ones into my lap, playing with them and attempting modest contributions to household tasks associated with preparing for houseguests will compensate for my missing exercises. Such activities will still help strengthen and reeducate some of the same stroke-affected muscles, brain cells and nerves that my exercises target. That is my theory anyway. Since I took word verification off this blog, the automated commenting has hit again. I am thankful that Blogger’s spam filter has kept all but one of those comments from appearing as a comment on my blog. That is pretty impressive considering the deluge, close to 200 by midmorning today and 2,286 since I took word verification off on Nov. 27. I started today’s therapy session in a prone position with my left shoulder encased in a heating pad wrapped in towels. Recent cooler temperatures have increased the stroke-induced tone that tightens my shoulder to a painful degree. 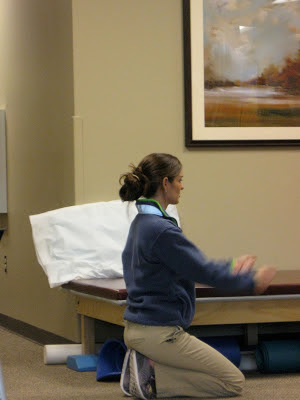 To combat that tightness a 15-minute appointment with the heating pad has preceded my working with occupational therapist Amy to improve the strength and control of my left arm muscles. Today I pulled out my camera during my date with the heating pad and shot what I could see. The challenge was my position on a mat in a far corner at the back of the gym, the need to avoid having other patients in my snaps and unsteadiness. 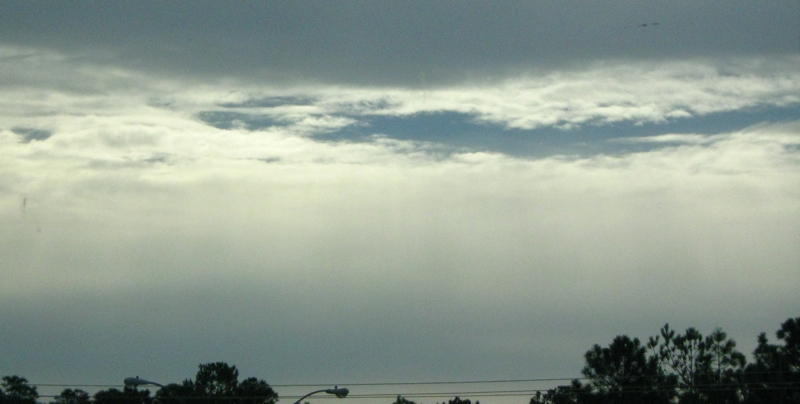 To my right were windows with a view of the sky. To my left Amy was working with another patient. 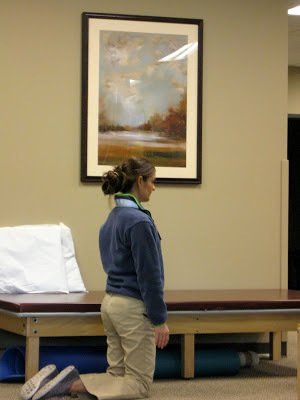 For me and for her other patients Amy devises creative exercises to fit the specific deficiences her patients experience. If it helps a patient, Amy doesn’t hesitate to take to the floor. Amy works with another patient. My photo session wasn’t stellar. But my therapy session with Amy was more positive. The workout she gave my left shoulder and arm also gave the right side of my brain a vigorous retraining experience. She held my arm up and away with a red theraband. As I lay on my back, my job was to bring my arm back to my side with my elbow straight. I could do it if I could look at my arm. But that was a no no. Amy doesn’t want me to develop the habit of looking down in order to move my arm. She rounded up a bell, positioned it where my hand should wind up. Then she talked me through the movement. As I had a few successes ringing the bell I could tell my control was improving with fewer verbal cues. I still have little sensory input other than sight and sound about what is happening on my left side. I hope that, as with earlier movements I have relearned, I will begin to recognize other cues about where my arm is and what it is doing as I become more successful in accomplishing specific movements. From where I lie, that possibility looks pretty good to me. 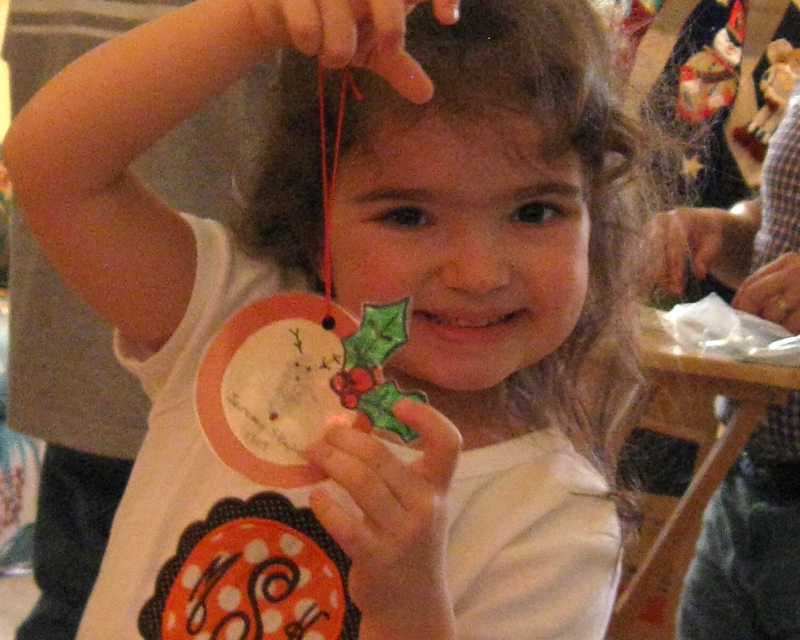 It’s time to decorate Baboo and Nana’s tree! The decorating that our grands, ages 2, 4, 6, and 10 accomplished the day after Thanksgiving was a joyful and laughter-filled experience for this grandmother, even as I struggled to keep my laughter diplomatically contained. 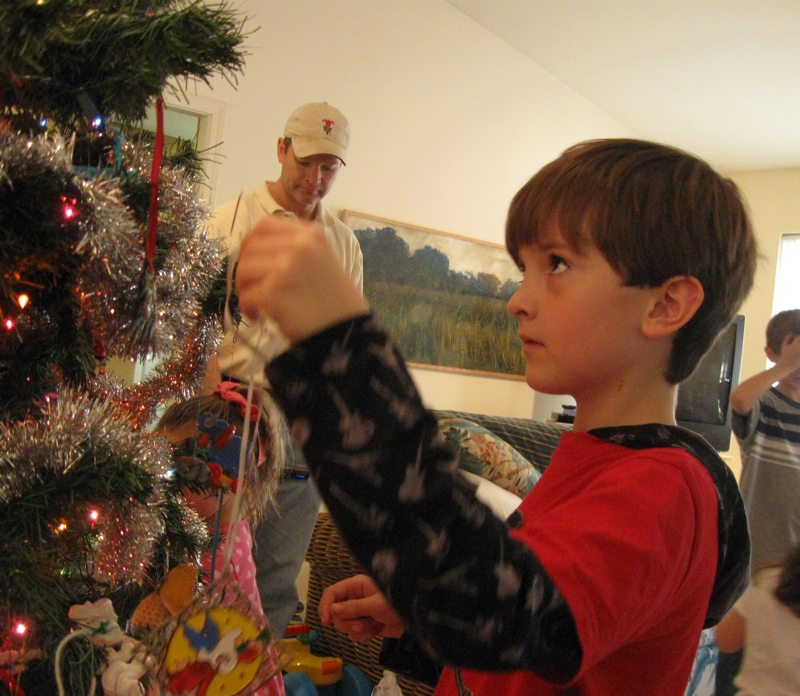 Of course, our sons and daughters-in-law kept things moving by fitting ornaments with hangers as needed and parceling out the tree decorations in an orderly procession. 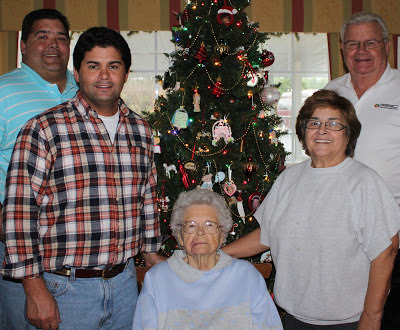 I was surprised at the intense concentration common to each of the grands, regardless of age. 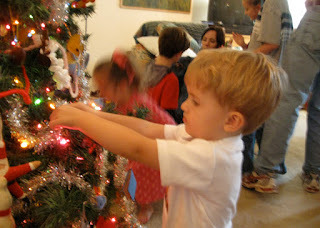 They solemnly considered positioning options, then carefully hung each ornament. 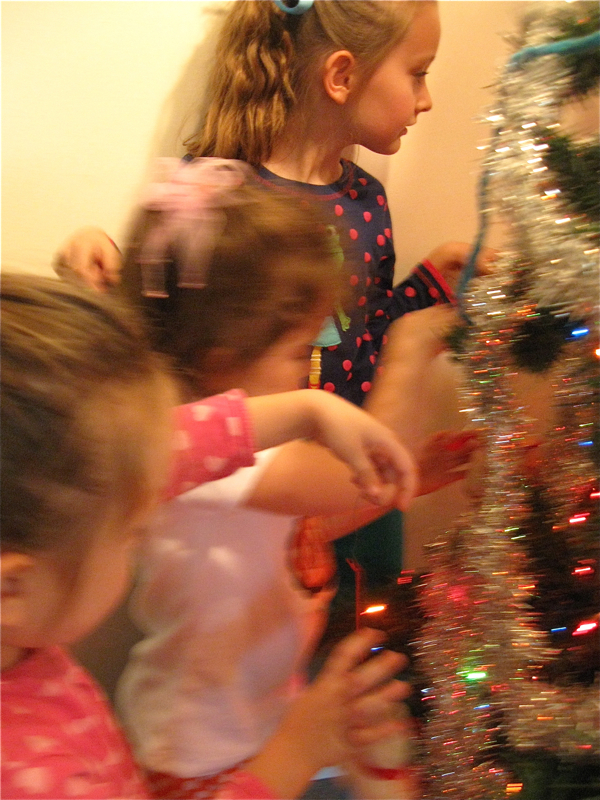 The youngest all headed for the same branches within their reach. Charlie, top, leads the girl squad. Walker, 2, gets the job done. Nate was recovering from a bug, but gamely decorated with style. This year the decorating exercise also included the transfer of a bit of family history as offspring questioned their elders about specific ornaments. Charlie is happy with the Garfield Santa her dad Walt received as a youngster. 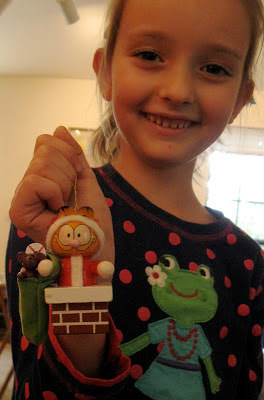 Molly Kate proudly displays the Rudolph the Red-Nosed Reindeer that her dad Jeremy made from his thumb-print in elementary school a couple of decades ago. 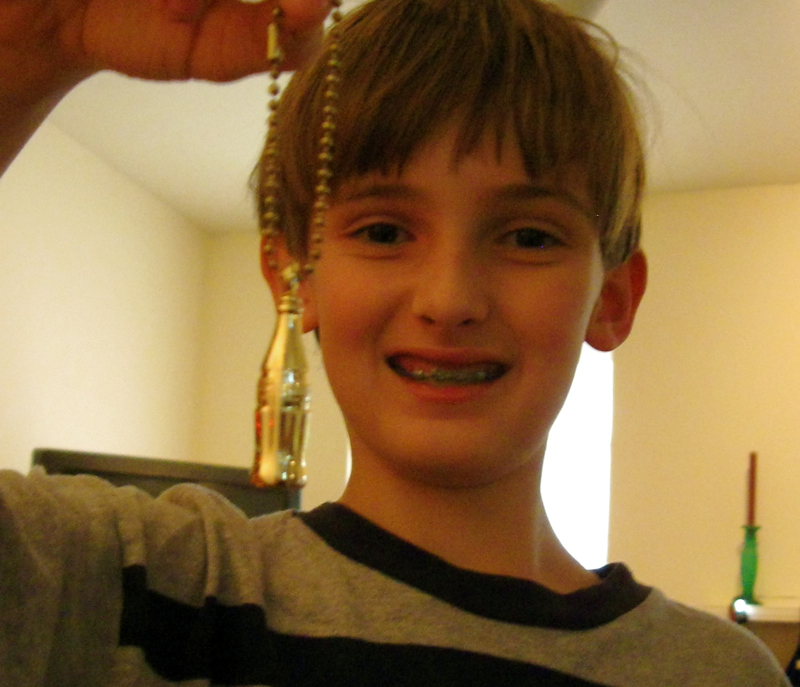 Luke likes the Coke keychain that poses as a tree ornament. Maybe our oldest grand will join Nana in her rabid appreciation of Coke. The bug Nate had picked up Thursday migrated to his sisters. Its effect on Stella warranted a trip to one of the local urgent care clinics before the family attempted the return to Georgia Saturday. The clinic staff provided medication and banished the specter of dehydration. Both families headed home. We were thankful for the call that evening letting us know that the Georgia Skupiens made it home safely and without any further cookie-tossing incidents. Our girls, ready for the extended family Christmas get-together Friday evening: From the left, Sarah and daughters Charlie and Stella; Molly Kate and her mom Katie. With the exception of Thanksgiving night, the Georgia crew bunked with us for the week and divided their visiting time between the home of Sarah’s parents and our home. Thursday night she and the boys stayed at her childhood home and the girls and Dad stayed with us. Then the next day youngest son Jeremy and his crew arrived. After the busy times with our family all together, Husband Walter and I spent a quiet Saturday at home. But I haven’t had a chance to miss our young families. 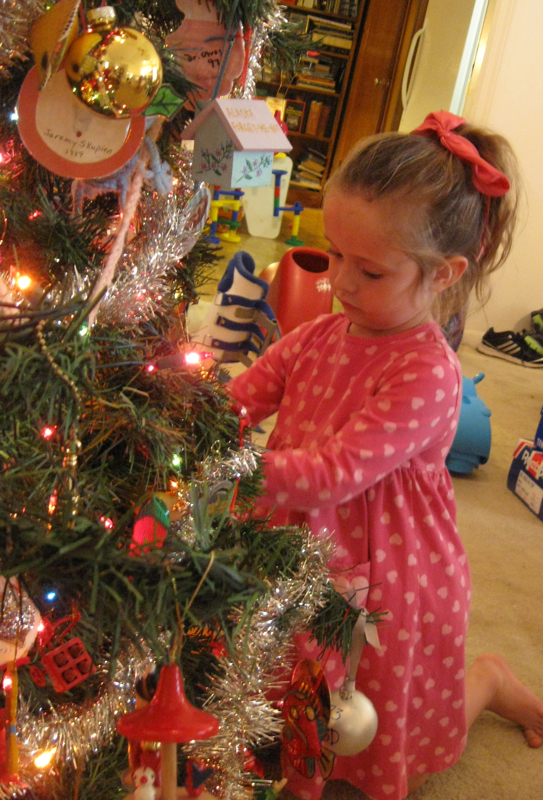 Every time I walk by the Christmas tree and see all those ornaments bunched together on the lower branches, I break out in a big grin. And for a moment those loved ones, big, little and in between, are right here with me. 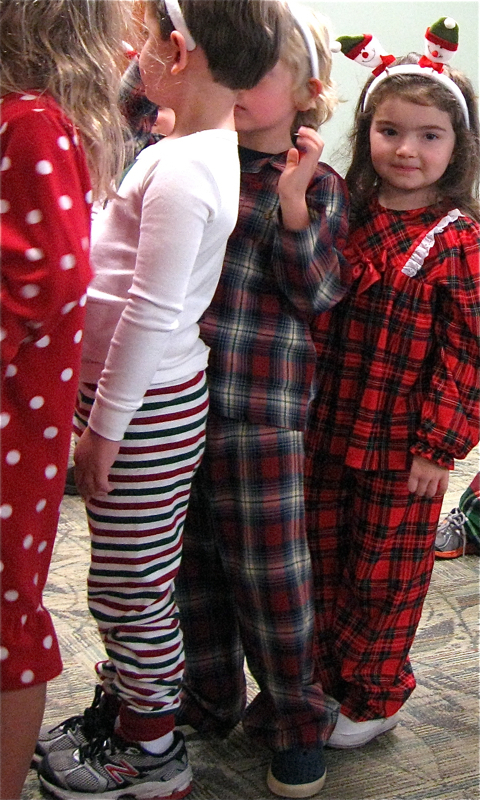 At right is the Christmas Bunny, AKA Grandaughter Molly Kate, with her cousin Stella, our other four-year old grand, sporting evidence of the banana-split ice cream Baboo dished out. Our little part of the Skupien clan usually celebrates Thanksgiving on the Friday after Thanksgiving Day. This year, however, the holidays merged a bit. Instead of a Thanksgiving meal, we shared a light, casual lunch, anticipating the annual Christmas gathering of our extended family of Skupien relatives Friday evening. Scheduling was a bit sudden, which helped increase my enjoyment as I had little time to dither about what to get for the adults’ Dirty Santa gift exchange or what to bring for the communal feast. In fact, the younger generation had taken over all the organizing and we adults and the not-yet-adult cousins had a wonderful time last night. Thank you to all the adult Skupien kids! 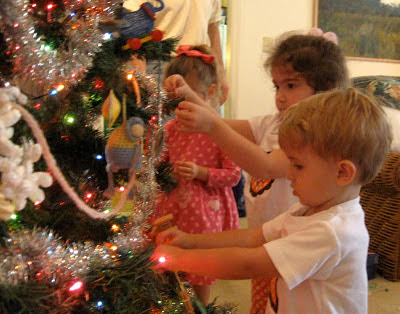 We still had time early Friday afternoon for our grands to play together and to decorate the Christmas tree, a day-after Thanksgiving tradition now in its third year. More photos to come on that. Our blogging daughter-in-law Katie and I shared a collective moan about how behind we both are on our respective blogs. Katie does a better job of keeping posts in the chronological order of special events and every-day moments in her children’s lives. But we both blog so that we don’t forget things. She records memories of what her family is experiencing in these early days of Molly Kate and Walker’s childhoods. 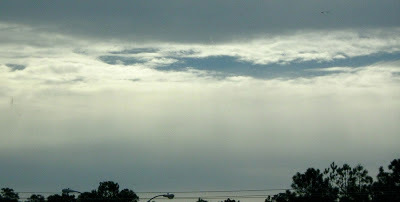 I blog to record memories of my thoughts and experiences in this retirement stage of life. I will eventually finish posting about our recent travels and at-home observations, hopefully before we take off on another jaunt planned for early December. 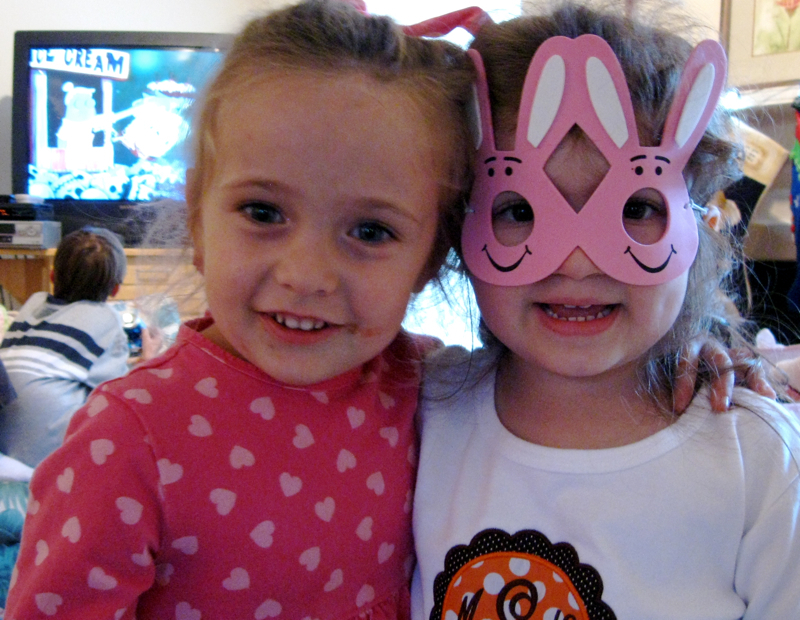 Oh, about that Christmas bunny in the photo: Donning bunny masks at nearly every visit is a tradition started and carried forward by our youngest grands. My mother-in-law, Grandma Sugar, a veteran bargain shopper, gifted the little ones with packs of the masks several Easters ago. The masks reside with the toys at our house until grands visit. I am always amazed that the masks have endured so long. Thank you, Grandma Sugar for sparking fun and helping your great grandchildren make happy memories. Anniversary celebration: Late or early? 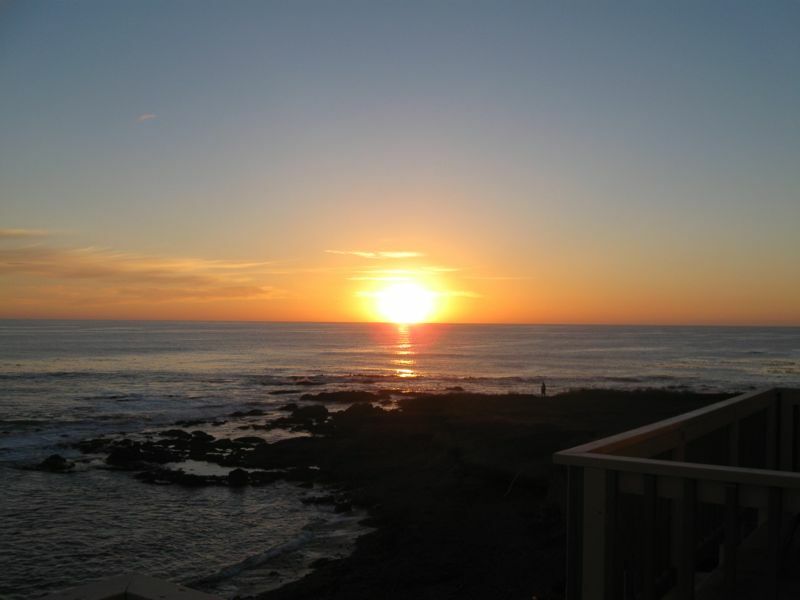 When Husband Walter was making reservations for a night at The Tides Inn, Shelter Cove, California, what he thought was a casual conversation followed a query about recent special occasions on our calendar. He had mentioned that our 45th wedding anniversary had come and gone. Evidently the conversation was more purposeful than he realized. The result was the little bride and groom welcoming committee above that we saw as we entered our suite at The Tides Inn. 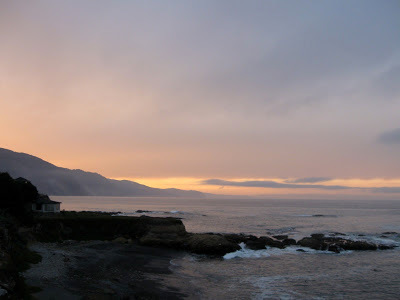 It was worth the drive on a winding, narrow road to reach our night’s lodging perched high above the rocks and waves at the edge of the Pacific. It was the slow season, and we were the only guests. The weather was beautiful and our cozy suite included a balcony that overlooked the Pacific with a front-row seat for experiencing the changing hues of sky and sea, the calls of seals, the sounds of waves breaking on rocks and shore, and the clean salt-water scent and sensations that accompanied our air supply. It was a picture-perfect end to Day Three and to the start of Day Four of our nine-day West Coast trip. Perhaps my procrastination has already cast the die for 45th, though. The opportunity for a November anniversary something is almost gone. One thing for sure, whenever and wherever we celebrate future anniversaries, the setting will not match the dramatic environment of Shelter Cove, California. I received my third botox treatment for muscle spasticity this week. My visit to my neurologist also included a comprehensive discussion of my April 22, 2011, hemorrhagic stroke. Although more than 18 months seems a long wait for details, I think the information arrived right on time and in language I could absorb--mostly. The inevitable inaccuracies are all my own. I have been seeing a neurologist for about nine months. In response to my request in a previous office visit, he went into teaching mode during this appointment. We examined two cat scans: one made soon after the stroke and the second near the end of my 27-day stint in an in-patient rehab center. My neuro doc also gave me guided tours of the MRI I had several weeks ago plus dozens of images pulled up through Google, of other stroke-affected brains. That internal capsule is a structure where a large number of motor and sensory fibers are bundled together and lead to the spinal cord. I borrowed the image below from Stanford School of Medicine’s “Stanford 25” Website. If my stroke had been even a little bit to one side or the other, the internal capsule would have escaped the degree of damage I experienced. Likely in that case I would already have recovered more range of movement in my shoulder and arm, at least some function in my elbow, wrist, fingers and thumb and maybe even some sensory input on my left side. The speculations about what might have been are all from my own inference from what my doctor said and from what I gleaned via Google. Although I have a long way to go before my left hand and arm are contributing substantially to tasks of daily living, the fact that they are contributing at all is improvement. Rather than despair at learning the specifics of the damage to my brain, I find it interesting. This knowledge is part of my journey. And I am buoyed up by the improvement that has occurred in my condition. I know that function can be regained because I am regaining function, slowly and in minute increments, but it is happening. I am not sure what my reaction would have been if I had learned all the details earlier in my recovery. Looking back on those early days of inpatient rehab, I realize that sometimes what I heard from therapists and physicians was not what they were actually saying. A long-haul recovery wasn’t on my horizon. I think I just assumed everything would be back to normal shortly and processed everything to fit that assumption. Now I am in the long haul, and I am thankful for all the folks who are hanging in there with me. A Google note: Googling “internal capsule” launched me into a brief exploration of the Stanford 25. That has been an adventure in itself. I appreciated evidence of the Stanford School of Medicine’s common-sense emphasis on mastery of hands-on, bedside examination as a crucial element of accurate diagnosis. And I appreciate even more my neurologist. He did a year’s fellowship with the reigning leader in the use of botox to treat muscle spasticity like mine. The field is so new that techniques are not readily available in books or papers. At this stage, my neurologist explained, the treatment is a combination of art and science. With completion of my third set of botox injections, I have observed that combination in action in his treatments. And I am alsoconvinced that he could probably make it in stand-up comedy. His stories are hilarious. But it was no laughing matter when I walked out of that office and could immediately see that my elbow was straighter. And that was without the usual monumental effort from me to force it straight.